According to a recent Nielsen consumer survey, digital signage at the point-of-sale considerably increases brand awareness by 14 percent and, more importantly, increases sales by as much as 33 percent. It’s one of many data points that underscore the worldwide growth of digital signage systems. Simply put, they work. They’re also complex. Coupling end-user performance and price requirements with an extensive array of moving parts, the solution options and combinations can become mind-boggling. Making matters worse, few standards are in place for digital signage solutions, resulting in compatibility and interoperability issues between media players and displays. This not only hinders quick implementation, it increases cost and reduces the solution’s lifespan due to faster obsolescence of key components. * are compliant with Intel® Open Pluggable Specification (OPS), a design and development standard that eases installation, simplifies upgrades, and reduces maintenance. * provide greater interoperability while addressing fragmentation in the digital signage industry. * have been proven to be among the most compatible Intel® OPS-based players available, year after year. * can be designed to fulfill multiple applications, such as interactive displays and kiosks, digital menu boards, transit system advertising, and virtual team collaboration. * simplify implementation, no matter the size or scale of the business. "Before Intel® OPS became the standard, we had our own proprietary pluggable module," said Matthew Lee, Axiomtek’s executive vice president - Axiomtek USA. "But when it became clear that Intel® was focused on creating an open standard, we were eager to support their quest. To us, Intel’s open standard approach was more important than a proprietary idea or technology because we believed that it would ultimately strengthen and expand the market. The open standard would benefit many of our clients in the industry, and that was the main reason for us to fully support Intel® OPS." In addition to Intel, Axiomtek’s partnerships with display manufacturers and solution providers (resellers, system integrators and more) further highlight its commitment to the digital signage industry. Axiomtek’s OPS-compliant digital signage systems are installed across the globe, helping diverse industries - from retail and transportation to education and healthcare - to capitalize on the power of dynamic digital sign technologies and ultimately enhance their brand awareness and sales. Two of Axiomtek’s clients listed below have chosen one of Axiomtek’s OPS-compliant digital signage systems as the solution for their challenging and diverse needs. They are among many clients who have continued to enjoy the benefits of Axiomtek’s OPS-compliant digital signage systems. 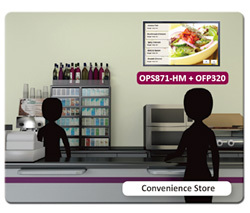 Solution: Axiomtek’s OPS-compliant Intel® Core™-based OPS871-HM signage player was chosen because of its plug-and-play compatibility with other OPS-compliant digital sign components, quick set up, remote maintenance, powerful performance and exceptional scalability due to its Intel® technology foundation. Solution: Axiomtek’s interactive e-Board solution was chosen. The ease of integrating Axiomtek’s OPS-compliant media player (OPS870) with the interactive 31.5-inch touch screen (OFP321), coupled with its reliable and high-performance Intel® processor have made the e-Board system their smart choice. The system is designed for fast, straightforward installation and trouble-free maintenance. It also offers excellent computing power, exceptional up-time dependability and easy upgrade options. All-in-all, the e-Board is the right solution for their needs. Results: The Board of Education has since deployed the Axiomtek e-Board solution in several educational settings, replacing projectors, blackboards and traditional white boards. Axiomtek’s e-Board has brought new life to lessons and presentations, increased collaboration between teachers and students and expanded overall learning opportunities while reduced total cost of ownership.